The LM-400 has a hand-carved, fully graduated solid Spruce top, as well as a hand carved fully graduated solid figured Maple back and sides.This fine instrument is assembled with a one-piece, rounded v-profile flamed maple neck and bound rosewood fretboard, compensated ebony bridge and vintage-style tuners. 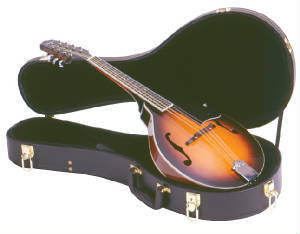 The bone nut and ebony bridge allow for the singing sustain that professional players look for in a high-quality hand-assembled mandolin. The Loar Fern M.O.P./Abalone Headstock Inlay completes the look. The nitrocellulose lacquer is thinly sprayed on the vintage sunburst finish and then hand-buffed for a finish that is beautiful and lets the voice of the instrument speak clearly.